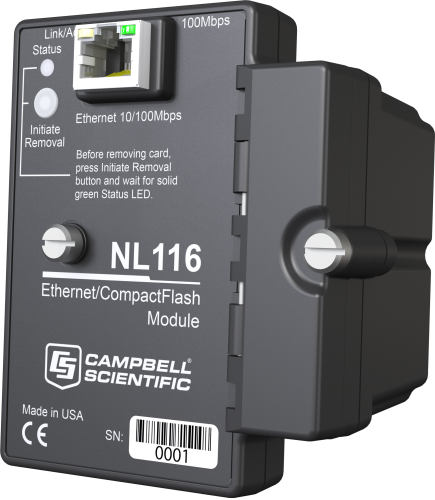 Das NL116 von Campbell Scientific ermöglicht 10baseT Ethernetkommunikation mit dem Logger und die Erweiterung des Speicherplatzes über CF-Karten auf bis zu 16 GB. Es kann am Peripherieport eines CR1000 oder CR3000 angeschlossen werden. One Type I or Type II (CF) card fits into the NL116’s card slot. Campbell Scientific offers and recommends the CFMC256M, CFMC2G, and CFMC16G CF cards (see Ordering Information). Only industrial-grade CF cards should be used with our products. Although consumer-grade cards cost less than industrial-grade cards, the consumer-grade cards are more susceptible to failure, resulting in both the loss of the card and its stored data. Industrial-grade cards also function over wider temperature ranges and have longer life spans than consumer-grade cards. The NL116/CF card combination can be used to expand the data logger’s memory, transport data/programs from the field site(s) to the office, and upload power up functions. The computer can read the CF card with the computer’s USB port and the 17752 Reader/Writer. CompactFlash Cards Campbell Scientific recommends industrial-rated cards. A CR1000 or CR3000 datalogger using operating system version 28 or greater is required.